If you’re going to operate a business that can be sustainable and serve your customer base well, you need to know who they are. Unfortunately, even though our business has existed for almost 7 years now, I have never taken a moment to ask my clients anything about how we can serve them well. I don’t know how they know us, what their specific needs are, or how they like engaging with our company. So I have been operating on assumptions and serving needs where and when they would pop up. About 2 months ago I started our first client and reader survey to find out more about who was engaging with the website, Facebook, Twitter, and overall internet presence and I was quite surprised at the results. I had made some poor assumptions about who I was serving and I was wrong. Doing this survey explained a lot to me about why we haven’t been able to reach certain goals as a company and more importantly what we need to do in the future to serve people better. We received about 800 responses from the people of the internet. Below are the results from my now annual reader and client survey along with my insights into what the info for 2016 is telling me. Since this survey was primarily intended for the audience our company engages with online, this wasn’t a huge surprise. I wrote my first book in March 2016 and really started engaging with internet marketing and strategies about 24 months ago, even though I’ve been writing online now for 7 years. There’s tons of value in knowing the age of your target audience. Knowing that most of the people that interact with me on the internet are in a similar life stage that I’m in is going to help me produce content that fits in with that same demographic. For example, I can write an article about the top 20 ways to pay for college on my own website and since 65% of those reading the article are between 25-40, they have no use for that article. It doesn’t apply to them. They’re either fresh out of college themselves or their kids are still 5-10 years away from college. I shouldn’t create content about how to travel the world well when you’re retired because exactly 0% of those in the survey are in retirement age. This doesn’t mean I can’t write these articles. It just means I should publish that article to a more select audience on a website where that article would provide more value to more people, because it doesn’t serve the majority of my audience that I’m connected with well right now. I honestly expected a more 50/50 split. But knowing this will impact the other voices that I bring into our company. If I added another voice to the podcast for example, it’d be beneficial if it were a female that could help me relate to 70% of those listening. Married women in their 30’s. That’s the demographic of who is primarily interacting with content I produce online. It’s not what I expected. It’s not who I’ve been developing content for the past 5 years. I honestly thought I’ve been producing content for young families and young men in the mid-20’s… because I was a young family man in my mid-20’s when I started all of this. No surprises here. However this was a solid validation for me. Part of the company mission is to help people get out of debt. If those that were interacting with our content didn’t have any debt, that’d be silly for me to produce content focused on that area. So we have a good chunk of people in the $5,000-$30,000 range, and another good chunk of people in the $30,000-$60,000 range. For average purposes, this helps me know what advice to give that can help most people. Because as I’m writing an article, or recording a podcast episode, or creating a video series, I have a certain audience member in my head that I’m speaking to. More often than not, I draw from my own perspective when we had non-consumer debt and our number fell in the $100k+ range. That’s not what people that are looking to me for advice are experiencing. So now when I produce content I can say, “If you have $10k in debt, do this….or if you have $60k, do this….” It allows me to more deeply connect on an individual level with each piece of content. As a side note, way to go 21.2% that are debt free! The big 3. Student Loans, Car Payments, and Credit Cards. So when I’m creating “Get Out of Debt” products and content, I know that I can briefly touch on personal loans, 401k loans, and HELOC’s. But I need to spend my time focusing on the big 3. This is a pretty good reflection of income ranges in North America. What did surprise me is that over 60% are making well over the median household income. It just goes to show that no matter your income level, you still need money help. I expected there to be more Dual Income Earning Families. This was a big surprise to see it split so evenly. So now I know I can develop content for stay at home parents and that over 50% of people could benefit from it. I wrote this book in 2013. Before I really started getting big on internet marketing. And clearly I’ve done a terrible job promoting it and giving a compelling reason why it can help. My writing style has improved drastically since 2013, but the value of the book is still quite solid. I’m still proud of it. But I’ve got to do a better job learning how to market books. That’s on me and something I can learn to improve. 55% rated themselves at a 5 or below. Again this is just validation and confirmation that people need help in this area. If these numbers were reversed I’d be in the wrong business. I was actually surprised at the little sliver of “Not Really” but the vast majority of people that interact with my online content want to be debt free. I’m an idiot. 68.7% of people that interact with me online trust me enough to exchange their hard earned money for a class, product, or software to help them with money and I haven’t created one yet. As a business owner, that’s a horrible feeling. People want something from me, I can benefit from it in the process, and nobody is being served. Ugh. I was super surprised by the answer to this question. 34% of people love their career. Another 33% say they’re pretty happy with where they work. That’s completely opposite of a Wall Street Journal Study that says 8 out of 10 people HATE their job. I guess I’m hanging around pretty happy, awesome people on the inter-webs. I had plans to develop curriculum and content that would help with working through transitions into a “dream” career. But with 67% of my clients and readers saying they’re pretty happy already, it doesn’t make sense. This one question probably saved me 3 months of work and money and marketing and promotion for a product that likely wouldn’t sell much. On the opposite end however, people want to make more money. 79% feel they’d like to make a little more, a lot more, or making more money is a necessity. That’s something I know how to do well and can help with. There’s a need that I can serve that I’ve been missing and would’ve continued to miss without this survey. Since the answers got cut off on the chart, they are: Knowing what to do with money, Accountability with money, Discussing money with your spouse, Managing a Budget, and Earning more money. Again, I’ve been putting together some content to help people engage better in their marriage about money discussions. That’ll help 16% of people. I’ve been putting together content that teaches the “how-to” type stuff. That’ll help 15% of people. What it looks like I need to be working on is Accountability groups, budget tracking and managing tools, and education for making more money. I thought a larger percentage of people would be struggling in this area. That’s probably just me projecting my former issues onto my clients. But I’ve spent a lot of time and effort into creating content over the past few years helping people get on the same page with money with their spouse. That content benefits maybe 25% of my clients, while the other 75% are doing pretty awesome. Again, I’m an idiot. 52% of my clients would pay me $10/month ($120/year) if I’d just develop some easy to use software. Another 30% would use the tool if I had a free version. As a business owner that’s tens of thousands in revenue being missed out on. As a person that wants to help people, they’re basically screaming at me to create something to help them and I haven’t…. yet. This is kind of a new dream. I think we could host a pretty awesome conference that’s less “feel good” and more tangible action and equipping. So I was just curious if people had any interest in something like this. 37% said they’re likely in and over 85% said they’d interested. That’s enough of a response to really consider doing this thing! Here are the answers: Getting out of debt. Boosting income. Relationships with money. Real estate. Investments. College planning. Small business. Marketing. Boosting income and small business were the 2 stand outs in this group. They also are things I’m super passionate about. It doesn’t mean I’ll do less of the other stuff, but my focus may shift some so I’m helping people with what they’re asking for most. So here is the shocker. As much as everyone says to have your own domain and website… the vast majority of people want to just interact with my content on social media. That’s why if you go through the archives of caseylewis.com you’ll see that there hasn’t been a lot of new content published lately. But if you go through my Facebook timeline for the past few months, in between the jokes and pictures of queso, you’re going to find regular status updates that are “mini-blog-posts” on a very regular basis. This is an indicator of a shift in technology and web design. I don’t know exactly what it means yet, but I know social media and mobile ready content is how I’m going to interact with people more in the future. Still an idiot. More than 50% of people would pay me $100 to create a class about stuff I’ve personally done and know a lot about. And I haven’t created the class. Yep. Idiot still. I asked a direct question if someone would pay me if I created something and they’ve overwhelmingly said yes. This is tens of thousands in revenue for the business, but it’s also providing extreme value to help people. This was really the first big product I launched online besides my book. I’d say I did a better job of getting the word out. This was also valuable data to see because I know how many people purchased the Fit Money Challenge. I know how many people took the survey and I know how many people say they’ve heard about the challenge. That gives me a good ratio to know how many people will sign up for the next round based on the number of people I tell about it. And speaking of the next round, 52% of those on the survey said they’d participate in a new round and they told me what price range they’d be willing to pay. This is great for the pricing strategy when we do launch a new round of the challenge. I personally hate my wallet. I always have. It’s hard to use cash and carry a traditional wallet. I’ve been search for a while and been unable to find something that works so I personally want to create my own. I thought it’d be huge and that my clients would like it. But 67% aren’t interested or don’t even know what it is. It’s tough to create a product around those numbers. I think this falls into the social media shift happening as well. I’m glad I asked this question because my thoughts were to spend a lot of time and effort on designing and creating an awesome website filled with specific content. But it doesn’t appear it’d be a go to source for the majority of my audience. I still may create it because it serves value for those that need it, but it’s no longer a priority. So that’s what I learned from my first reader survey. What do you think? Could your business benefit from gaining insights like this? 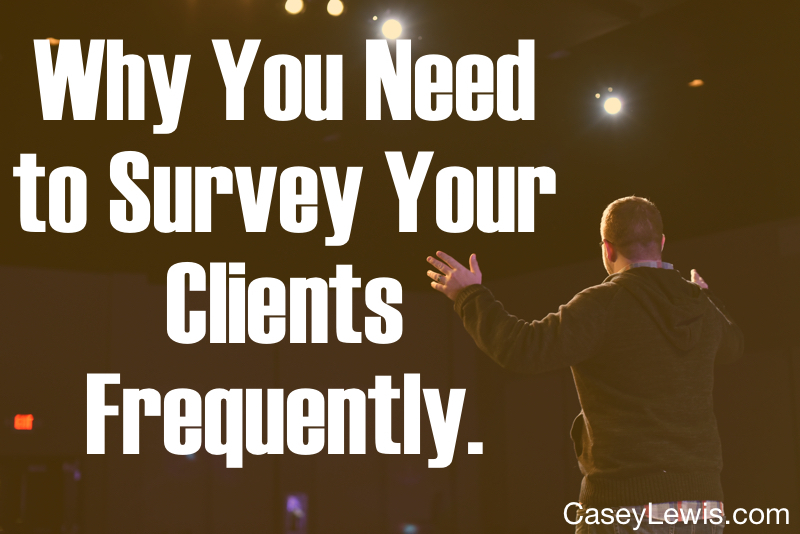 I’d love to help your company survey your own client base. If you’d like help on something like that, just reach out to me here.